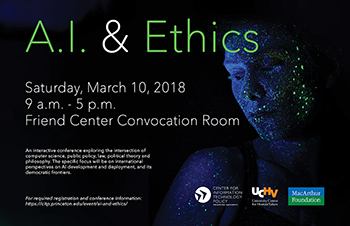 The University Center for Human Values (UCHV) and the Center for Information Technology Policy (CITP) at Princeton University are hosting a joint conference on ethics and artificial intelligence technology, which address a range of topics at the intersection of computer science, public policy, political theory and philosophy. This interactive conference will feature speakers and panel discussions, as well as several focused breakout groups in which participants and speakers will engage with one another directly. The major themes of this event will be moral imperialism and the democratic frontiers of artificial intelligence (see the schedule for more information). The aim of this event is to continue and deepen the ongoing conversation about ethics and artificial intelligence, with an eye toward the development of a set of intellectual and reasoning tools that can guide practitioners and policy makers in developing the ethical framework that will ultimately underpin their technical and legislative decisions. 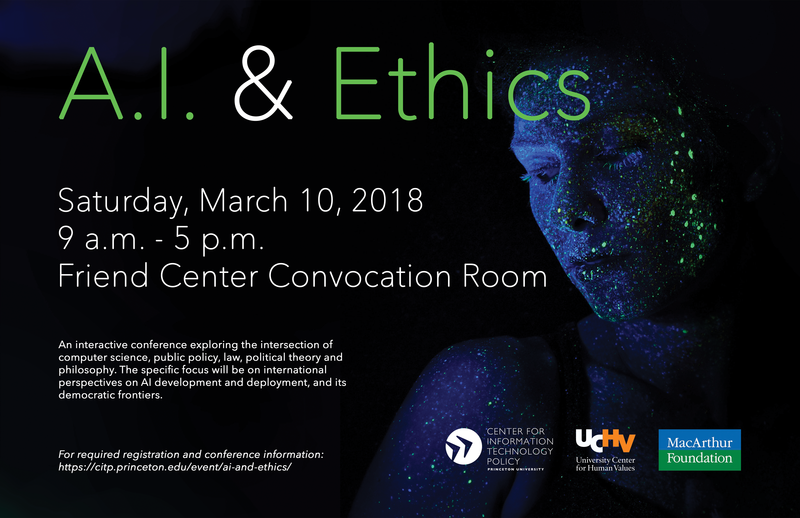 In fall 2017, the University Center for Human Values (UCHV) and the Center for Information Technology Policy (CITP) launched a joint initiative on AI and Ethics. This interdisciplinary series brings Princeton University faculty from the humanities, social sciences and computer science together with proprietors of AI technologies and others working in the field in order to discuss the intersection of philosophical and technical issues raised by new developments in artificial intelligence technologies. In this project, we encourage a critical and positive approach to set some parameters within which these technologies can be further developed in keeping with human values considerations and engineering feasibilities. Chloé was a 2015-2017 values and public policy postdoctoral research associate with an appointment in the Woodrow Wilson School/Center for the Study of Democratic Politics and the University Center for Human Values. Chloé is a political and legal theorist with an empirical background in American politics. Her research focuses on questions of democratic theory, the history of modern political thought and public law. She is currently working on a book manuscript, Small Talk? The Impact of Social Speech on Liberal Democratic Citizenship, that considers and maps the positive and negative effects of everyday talk on liberal democratic citizenship and political outcomes. Chloé holds an A.M. and Ph.D. in political science from the University of Pennsylvania, and a bachelor’s degree in politics from New York University. Jack Clark is the strategy and communications director for OpenAI, where he focuses on policy, safety, strategy, and communications. He also helps to run the AI Index, an initiative from the Stanford One Hundred Year Study on AI to track and analyze AI progress. In his spare time he writes a weekly newsletter about cutting-edge AI research and applications called Import AI (www.importai.net), which is read by more than ten thousand experts. Dr. Christina Colclough is director of platform & agency workers, digitalisation and rrade at UNI Global Union. UNI represents more than 20 million workers in the private services sectors. In this capacity, she leads UNIs work on everything digital. From how AI, Big Data, new technologies, data privacy and protection and new business forms effect work and workers’ rights, to trade and investment agreements and trade union responses to it all. In relation to data rights, UNI has just issued two key documents that aim to address regulatory gaps, namely: Top Ten Principles on Worker’s Data Privacy and Protection, and Top Ten Principles on Ethical AI. Prior to taken up this position in UNI’s head office, Christina was head of EU Affairs in UNI’s European office and general secretary for the Nordic Financial Unions in Sweden. Before joining the trade union movement, she was a labour market researcher for 7 years at Copenhagen University, from where she also holds a Ph.D. in sociology. Christina was born in the UK, and has since lived in six countries. Stefanie Felsberger is a senior researcher at the Access to Knowledge for Development Center at the American University in Cairo. Her work focuses on questions of access and control of data, knowledge, and technology, as well as the political economy of data, surveillance theory and the politics of gender. Stefanie is the center’s Bartlett Fellow and works in cooperation with the Access to Knowledge Fellow at the Internet Society Project at Yale University and the Access to Knowledge Global Academy (A2KGA). Stefanie is also a member of the EQUALS Research Group led by the United Nations University Computing and Society under the Global Partnership for Gender Equality and contributes to the center’s research in the area of Open Data for Development. Stefanie holds a magister (equivalent of BA and MA) both in Political Science and Arabic Studies from Vienna University and spent a year at Warwick University, United Kingdom. Danit Gal is a project assistant professor at the Global Research Institute at Keio University in Tokyo, Japan, where she works on strategic technology planning and the digital humanities. She’s also a Yenching Scholar at Peking University and International Strategic Advisor to the iCenter at Tsinghua University in Beijing, China. Danit chairs the working group of a new IEEE standard (P7009) on the Fail-Safe Design of Autonomous and Semi-Autonomous Systems, and chairs the Outreach Committee of The IEEE Global Initiative on the Ethics of Autonomous and Intelligent Systems. Passionate about developing, deploying, and using technology to benefit humanity, she is an active public speaker discussing the unique character of emerging technologies, their advantages, and shortcomings in East Asia. Andy Guess is an assistant professor of politics and public affairs at Princeton University. His research sits at the intersection of political communication, public opinion and political behavior. He uses a combination of experimental methods, large datasets, machince learning, and innovative measurement to study how people choose, process, spread and respond to information about politics. Zachary Hecht currently serves as the policy director to the Chair of the New York City Council Oversight & Investigations Unit. He previously served as the legislative director to the Chair of the City Council Committee on Technology, playing a key role in the formulation and passage of New York City’s algorithmic accountability legislation. Zachary holds a MSc in Digital Anthropology from University College London, where he examined the ways emergent digital technologies impact everyday life and did fieldwork with a community of vegan activists based in London. Ronaldo Lemos is an internationally respected Brazilian scholar and commentator on intellectual property, culture, and technology. He is a founding director of the Institute for Technology & Society of Rio de Janeiro (ITS Rio), and a visiting professor of technology policy at Columbia University’s School of International Public Affairs. He holds law degrees from University of São Paulo Law School and Harvard Law and has published a number books and journal articles. He was a visiting fellow at Princeton University’s CITP in 2011 and 2012. Ronaldo was one of the creators of the Marco Civil, a law in Brazil enacted in 2014 protecting civil rights online, privacy and net neutrality. Nick Monaco is a digital propaganda researcher and computational linguist at the Digital Intelligence Lab at the Institute for the Future in Palo Alto, CA. He is also a research affiliate at the Oxford Internet Institute and Graphika, and a former disinformation researcher at Google Jigsaw. Dillon is a technical fellow at the AI Now Institute in NYC. His current work looks at legal frameworks for algorithmic accountability, and studies the provenance of data used to train AI. Previously he was a research engineer with Princeton’s Center for Information Technology Policy and the Princeton Web Transparency and Accountability Project, and a software engineer on the Google privacy team. Rashida Richardson researches and analyzes state and local legislation, rules and regulations that implicate civil rights and civil liberties. Prior to working at the NYCLU, Rashida was a staff attorney at the Center for HIV Law and Policy, where she worked on a wide-range of HIV-related legal and policy issues, and she previously worked at Facebook Inc. and HIP Investor in San Francisco. During law school, Rashida was also selected as a research assistant for Professor Margaret Burnham in Northeastern University’s Civil Rights and Restorative Justice Project, where she participated in a landmark civil rights action against a county in Mississippi for a kidnapping and murder which took place in 1964. This suit was the first of its kind. Rashida graduated with honors from Wesleyan University in 2008, and she graduated from Northeastern University School of Law in 2011. Ben Zevenbergen is a visiting professional specialist at CITP. His work mostly consists of multidisciplinary investigations in the ethical, social, and legal impacts of Internet technologies, and vice versa. At CITP Ben is working on the engineering ethics and political theory impacts of artificial intelligence. His position is supported by Princeton’s Univeristy Center for Human Values. Ben is currently finishing a Ph.D. at the Oxford Internet Institute about the research ethics for technical projects that involve unsuspecting Internet users as data subjects. Next to his doctoral work, Ben been working actively with computer scientists and network engineers to develop a set of guidelines of ethics in networked systems research. Before returning to academia, Ben was a policy advisor to a politician in the European Parliament, working on Europe’s Digital Agenda and other Internet policy. Previously, Ben worked as an ICT/IP lawyer and policy consultant in the Netherlands. Ben holds a degree in law, specializing in Information Law. If you park on campus, you probably will want to park in Lot 21 and take a Princeton shuttle to the Friend Center. Shuttles may be tracked online or through a mobile app with TigerTracker. There are also metered parking spots and parking garages on campus and nearby in downtown Princeton. The closest parking is along Prospect Ave., you may also reference this parking map. To reach the Princeton campus from Princeton Junction, you may take a 15-minute cab ride, take a Princeton TigerPAWW bus, or transfer to a small train (the “Dinky”). From TigerPAWW or the Dinky, you may either walk or take a Princeton shuttle to the Friend Center. should you have any questions or require further information.